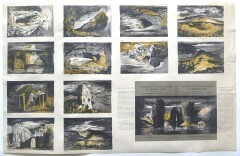 John Piper was a painter, print- maker, designer of glass, theatre designer. 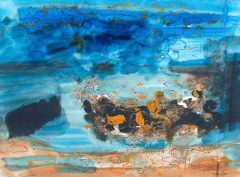 Born in Epsom, Surrey, John Piper studied law (1921-26) and worked in his father’s solicitor’s office before studying art at Kingston Art College and the Royal College of Art. Piper left the Royal College of Art in 1929. After writing an article about Wadsworth and meeting Ben Nicholson, he was invited to join the London Group in 1933 and later joined the ‘Seven and Five’ group in 1934-5. By the mid thirties, after a visit to Paris, Piper became influenced by the contemporary French painters and turned to abstraction. 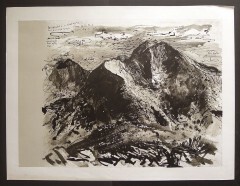 It was also in the mid 1930’s that Piper began colour lithography and that he became friends with Oliver Simon of the Curwen Press, consequently his interest in lithography and printmaking grew. 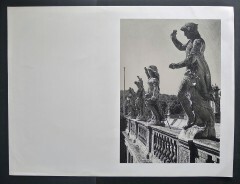 The Curwen Press printed many of his lithographs up to the 1970’s. 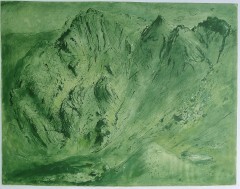 Stanley Jones, a technician at the press, also an artist, helped him to become more adventurous with his texturing and by adding photographic images applied mechanically to the plate. 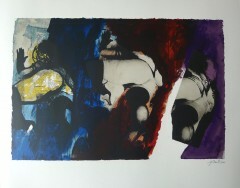 Piper produced nearly 400 lithographs in his lifetime. Piper did not just produce art, he wrote books and articles for magazines. In 1935-7, with his wife Myfanwy Evans, they produced ‘Axis- a Quarterly Review of Contemporary Abstract ’Painting and Sculpture’ , writing articles about contemporary artists including those in the St.Ives group and modern contemporary French artists who he knew and had met. During the Second World War, Piper became a war artist recording Britain at war. He later became a trustee of the Tate Gallery, a member of the Arts Council and a member of the Royal Fine Art Commission. After the war he was commissioned to do stained glass window designs which include Coventry Cathedral and Christchurch College Chapel, Oxford. He was made a Companion of Honour in 1972. 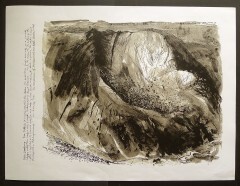 His work is held in many Museums and Galleries. 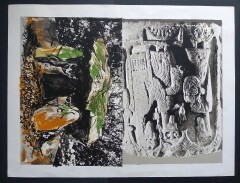 John Piper screen print ‘Stones and Bones: I and III, and (on reverse) Stones and Bones II.